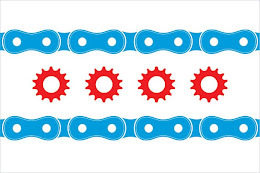 After writing the post comparing the changes to Chicago cycling culture and infrastructure between 2012 and 1993, an article by Reuters presented another contrast that is becoming present on the international level. Of the countries affected by the debt crisis in Europe, Greece has been hit particularly hard, with thousands ending up jobless and businesses shutting down. However, in light of the drastic economic downturn in that country, one industry has seen a large upsurge (can you guess?)....Bicycling. Cycling in Greece has seen a significant increase in correlation with high road taxes and fuel prices; it has been reported that more than 200,000 bicycles were sold in the year 2011. Conversely, car use has decreased by "more than 40 percent in each of the last two years." What is interesting to note is that the people of Greece seem to be approaching the notion of cycling as a primary means of transportation from a predominantly pragmatic perspective. With the financial security of so many of its citizens in question, the negative connotations that were traditionally attached to bicycles in Greece are being dispelled. The equalizing effect that the debt crisis has had in Greece is illustrated in the changing role of the bicycle as a symbol of poverty to one of social and economic dynamism. The issue of being "green" and/or environmentally conscious seems to be more of a beneficial afterthought. Which therein potentially lies the success of an enduring bike culture taking a foothold in Greece. The issue of ideologies can become murky as disagreements can arise between even similarly minded factions; however the idea of increasing the amount of disposable income in one's account is always going to have positive connotations attached to it. Bicycle shops are reportedly "sprouting up like mushrooms," the demand is so large to service the needs of cycling enthusiasts and beginners. Though the demand has at the moment outrun the government's ability to supply an adequate infrastructure for the rapid expansion in number of cyclists, that has not seemed to deter them from taking to the roads. In a fashion reminiscent of Mayor Daley's pledge to improve cycling infrastructure in Chicago in 1993 for the city's burgeoning bike culture, the mayor of Athens has proposed a plan to improve cycling for the capital's bike-minded inhabitants, albeit with the latter proposal being more ambitious than the former thanks to the advancements of time and technology. It is interesting to see parallels in the development of the cycling culture taking hold in Greece now with the one that gained traction in Chicago back in 1993. And though Greece may be late in seriously contemplating the viability of cycling as a mode of alternative transportation in comparison with other cities and countries, with its late entry it has the benefit of potentially learning from the mistakes and successes of its predecessors in Europe and throughout the world. And perhaps by modeling the successes of cities like Copenhagen which has translated the large percentage of its bicycle users into monetary savings for the government, a country like Greece can piggyback economically off the expanding number of its cycling citizens.